Named after the Italian nobleman Filippo degli Albizzi, the Silk Tree was first introduced to Europe in the mid-18th century. The flower, the form, the fragrance; this tree has it all, if only it could take a little more cold. Albizia julibrissin, is a small deciduous tree growing 15 to 25 feet (5-10 m) tall, with a broad and flat-topped spread. The smooth bark is of a green-grey colour and the leaves are dark green with many pairs of leaflets. As delicate as the leaves are, the flowers are even more so, resembling little pink puffs. And the heavenly fragrance of these blooms can be a great addition on a warm summer's evening. All aspects of the Silk Tree (sometimes called Mimosa) are refined, with its tiny leaves and its long arching branches. They are one of the last trees to leaf out in spring, doing so just at the point when the sun has gotten a little too warm, providing great shade with its large branches and falling at the time when the sun's warmth is most appreciated. Like all legumes they produce bean pods, each pod, which resemble a flattened bean pod made of paper, contains an average of 8 seeds. The form of the tree is well adapted to single story homes and won't overwhelm the structure as oaks, elms and ashes often do. 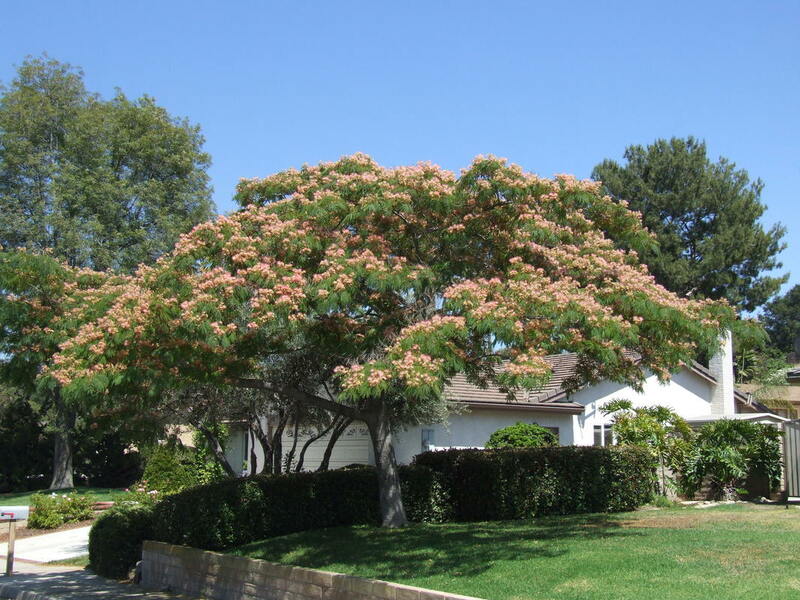 If you live in a reasonably warm area, a Silk Tree properly sited, will make a great addition.